Here’s what you see today at the Israeli-Palestinian Conflict page at The Independent. 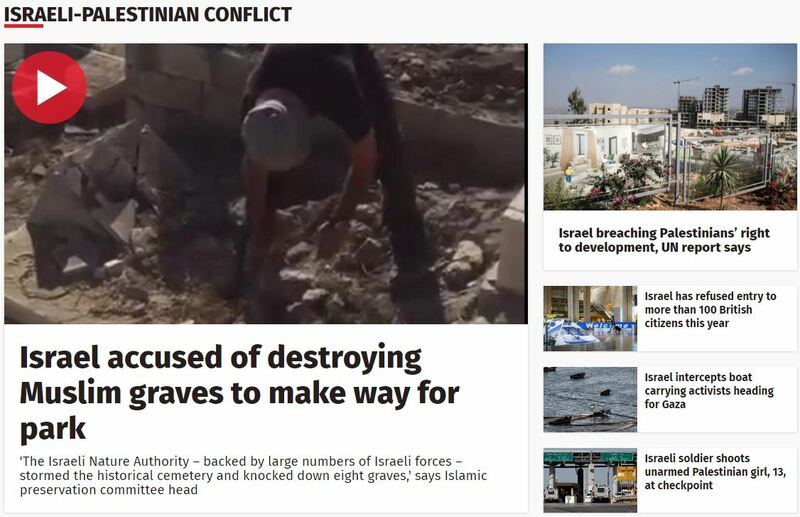 One article amplifies false Palestinian charges (see here) that Israel destroyed graves in a historic Muslim cemetery. One article misleads readers (see here) into believing that Israeli soldiers shot – for no particular reason – an unarmed 13-year-old Palestinian girl. One article cites a UN report which accuses Israel of breaching Palestinian rights to development. One article is based on a claim by academics at London’s School of Oriental and African Studies (SOAS) that Israel violates academic freedom by unfairly turning away British lecturers (who are pro-Palestinian activists) at the border. One article reports on the IDF’s interception of a boat carrying pro-Palestinian female activists trying to break Israel’s naval blockade of Gaza. So, Indy readers interested in learning about the Israeli-Palestinian Conflict are informed that Israel destroys Muslim graves, shoots innocent Palestinian children, breaches Palestinian rights to development and violates the academic freedom of pro-Palestinian Britons. The only reasonably fair piece, on the IDF’s interception of a boat full of pro-Palestinian activists, is actually an article by Associated Press (AP) republished by the Indy. Though this is only one day’s view of the Indy’s Israeli-Palestinian Conflict page, we’ve clearly demonstrated that this is indicative of a larger pattern of systemic bias against the Jewish state at the news site – one which we’ve been documenting for years. Considering their headlines, it’s obvious the Indy doesn’t think Palestine exists, either. Organize a Boycott of companies which advertise within the pages of Der Independent an Der Guardian. It’s sad how people only want to hear what goes with their perception of the Israeli-Palestinian Conflict (that was formed by the media in the first place). That kind of hings is happening in Palestine, and everyone in the Middle East knows that, it is too obvious when you don’t only rely on the biased media (such as this site) to get information. Indy is a reliable source of information and at least it has proofs of what his articles talk about. Writing an article saying that ‘they are biased against the Jewish state’ just because they are neutral and not biased With the Jewish state is ridiculous. Let us look at the first part of that sentence, “Indy is a reliable source of information..” is it really? You mean it is reliable because it is, or has been, using the services of such reliable journalists as Johann Hari, and Robert Fisk after whom ‘fisking’ is named? The whole middle east only knows what the biased Arab press wants it to know.